We have a special treat in store for you this summer at our West Coast workshop. Because of the generosity of an anonymous benefactor, we are bringing over two venerable musicians who played for many years with the Radio-Television Skopje Čalgija Orchestra. For the uninitiated, čalgija refers to a Macedonian urban, Ottoman-influenced style music, typically played in a heterophonic style on violin, oud, kanun (plucked zither) and other instruments. 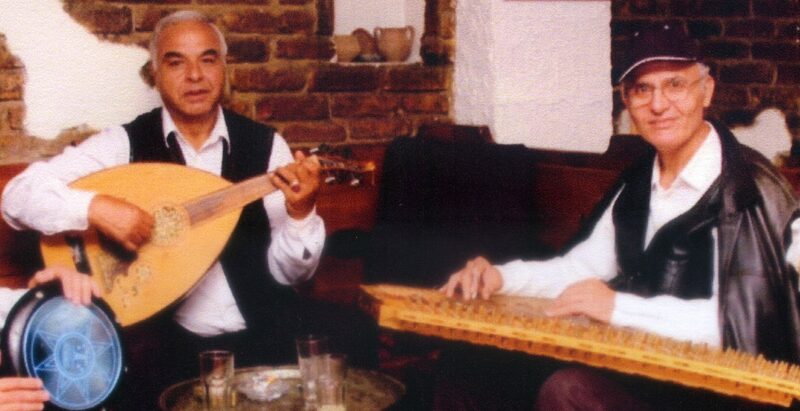 Oud (“ut” in Macedonian) master Raim Baki and kanun master Husref Said both come from long lines of Romani musicians who specialize in the čalgija genre. They will be teaching their respective instruments, and will team-teach a čalgija ensemble class at Mendocino. Professor Sonia Tamar Seeman, of University of Texas at Austin, will also be at camp to enhance the čalgija program with her expertise and scholarship. In addition, urban and village Macedonian music will be well represented this year, with Dragi Spasovski teaching singing, Mark Levy on Macedonian village (“izvorno”) ensemble and gajda, Adam Good on Macedonian tambura, Vlado Pupinoski on sax/clarinet and Romani ensemble, Jerry Kisslinger on tapan, and Polly Tapia Ferber on doumbek and frame drum. This list represents a mere fraction of our workshop staff offerings. Read all about these and other teachers on the camp pages: Mendocino and Iroquois Springs, and while you’re at it, register for one (or two!) unforgettable summer weeks.